… new jobless benefits claims down. Of course with this unemployment there’s just not that many jobs to lose thusly creating the newly jobless. Short version? Cut taxes and crank up spending to give the economy a boost. Job market, other indicators weak — double dip recession on the horizon? •Expanding its $2 trillion balance sheet with additional purchases of long-term securities. •Or reducing the minuscule interest banks earn on deposits with the central bank. Bernanke said the Fed must balance the benefits of employing unconventional monetary policy tools against their costs. Overly aggressive action could raise doubts that the Fed would be able to unwind its extraordinary assistance once the economy recovers. … home sales at lowest point since 1995. The latest foreclosure numbers carried a mixed message: They’re up 3.6% from the month before but down 9.7% from 12 months earlier. In July there were more than 325,000 foreclosure filings — including notices of default, auctions notices and bank repossessions. That is the 17th month in a row total filings exceeded 300,000, said RealtyTrac’s CEO, James Saccacio. … per the Fed. Not good news out there at all, and a lot of us are really feeling it right now. The U.S. economic recovery is weakening, the Federal Reserve warned at the conclusion of its meeting Tuesday, its most bearish outlook in more than a year. A chilling look at unemployment from January 2007 to May 2010. This is very easy news to believe. Things are still pretty rough out there. Federal Reserve policymakers, acknowledging a slowing in the economic recovery at their meeting in late June, began to consider the possibility of providing additional stimulus if growth fell sharply — a possibility that has become all the more real as signs of weakness have piled up. This ought to be sobering news for anyone still fretting over the state of the economy and why Main Street isn’t feeling anything close to a recovery right now. In the last two years, $40 billion worth of loans to small businesses have evaporated, and correcting the problem should be “front and center among our current policy challenges,” Ben Bernanke, chairman of the Federal Reserve, said in a speech Monday. Loans to small businesses dropped from more than $710 billion in the second quarter of 2008 to less than $670 billion in the first quarter of 2010, according to bank financial reports submitted to the Federal Financial Institutions Examination Council. Looking at these two reasons for the dramatic drop in business credit the first certainly has a role, but the second is the actual killer. I know of many small businesses that would happily take on new debt but can’t because their credit lines were slashed to the bone (sometimes for no discernible reason other than the overall economy was bad) and haven’t seen that credit flexibility return to this day. He cited weaker demand from Main Street businesses worried about taking on more debt during tough times, “deterioration in the financial condition of small businesses during the economic downturn,” and a lack of supply of available credit. “Clearly, though, to support the recovery, we need to find ways to ensure that creditworthy borrowers have access to needed loans,” Bernanke said. Is all spending equally productive, or should government policies aim to stimulate private investment? If the latter, then Mr. Obama is following in FDR’s footsteps and impeding recovery. He does so by demonizing business and creating regime uncertainty through new regulations and costly programs. In this he follows neither Hayek nor Keynes, since creating a lack of confidence is considered destructive by both. Somewhat encouraging news, but the reality on the ground is still very grim and I’m guessing will get worse before it improves. The International Monetary Fund raised its forecast for global growth this year, reflecting a stronger-than-expected first half, while warning that financial- market turmoil has increased the risks to the recovery. The world economy will expand 4.6 percent in 2010, the biggest gain since 2007, compared with an April projection of 4.2 percent, the Washington-based fund said in revisions yesterday to its World Economic Outlook. Growth next year is projected to be 4.3 percent, unchanged from the April forecast. Canada and the U.S. are leading advanced economies out of the worst recession since World War II, trailed by euro-area countries that need additional measures to boost confidence in their banks, the fund said. Faster expansions in Brazil, China and India are helping to protect the global recovery as a sovereign-debt crisis weighs on Europe, the IMF said. The question is did the recession push the unemployment benchmark to around seven percent, and if so will the Fed do damage to an already fragile economy by sticking with the previous benchmark of around five percent. Certainly food for economic thought. Federal Reserve policy makers say full employment means a long-term jobless rate between 5 percent and 5.3 percent. Some of the most influential economists say they’re wrong. Dean Maki at Barclays Capital, 2006 Nobel Prize-winner Edmund Phelps and Bank of America-Merrill Lynch’s Ethan Harris estimate the worst financial crisis since the Great Depression has pushed the so-called natural rate of unemployment to between 6.3 percent and 7.5 percent. Unless the Fed accepts that more Americans will be permanently out of work, the central bank may spur inflation by waiting too long to raise its benchmark rate from a record low, said Maki, Barclays’ chief U.S. economist and the most accurate forecaster in a December 2009 Bloomberg News survey. … everyone out there still dealing with a rough economic situation. Led by increases in prices for meat and dairy products, the overall cost of items in the FOX Business shopping cart rose sharply in April — the sixth time food basket prices have increased in the last seven months. The April increase — 56 cents, or 0.8% — was the largest month-month jump since August 2008. It sounds dreadful. After drifting down consistently since last fall, the unemployment rate has suddenly shot up again, from 9.7 percent in March to 9.9 percent in April. But don’t despair: A rising unemployment rate is actually one of the best signs yet that the economy is bouncing back. The unemployment rate rose for the right reason. Instead of shedding jobs, employers added 290,000 jobs in April, the strongest showing since 2007. The reason the unemployment rate went up is that a lot more people are suddenly looking for work. The government said that the labor force swelled by 805,000 people in April. That’s more than three times the number of new jobs, so the proportion of people looking for a job but unable to find one went up. Still, that big increase in the labor force marks an important shift in sentiment among people on the fringes of the economy. So-so at best. By all, or a least most, accounts the national recession is over and recovery, however slow, is going on right now. Break that national figure down a bit and the picture changes dramatically. Two-thirds of all states are still in a recession. That’s a lot of people who just get frustrated and angry when told things have hit bottom and are now getting better. For a lot of Americans things are not getting any better just yet. And Nevada is alone as the the state with a still-shrinking economy. The national recession may be over, but not everyone feels the change. Some industries and regions continue to suffer. The tepid 3% pace of growth in this recovery means no rising tide lifting all boats. Well, I suppose this falls more under conjecture than news, but quite frightening nonetheless. We may have avoided a second Great Depression to date, but the long-term effects on the U.S. economy may be very severe. Hopefully the economists who see major downturns rebounding with equally major expansions are correct. If this recession creates a large class of the permanently unemployed and drives more of the middle class down toward, or into, poverty, the social, political and economic repercussions probably are beyond our ability to imagine right now. A sizable and battered lower class does not make for a stable society. … tidings of, er, red flags and economic warnings. For 2 1/4 years now I have been saying that there is no chance of a repeat of the Great Depression or anything like it–that we know what to do and how to do it and will do it if things turn south. I don’t think I can say that anymore. In my estimation the chances of another big downward shock to the U.S. economy–a shock that would carry us from the 1/3-of-a-Great-Depression we have now to 2/3 or more–are about 5%. And it now looks very much as if if such a shock hits the U.S. government will be unable to do a d—– thing about it. But while there is a growing consensus that the so-called Great Recession ended some point earlier this year, some economists think that one quarter of solid economic growth does not indicate that a Great Recovery has begun. Unemployment continues to rise and about 30% of factory capacity remains idle. Credit for businesses is still tight and consumer confidence is falling. It’s also worth remembering that the economy grew as recently as the second quarter of 2008, when rebate checks sent to most taxpayers created a sugar rush of economic activity and a 1.5% rise in GDP. Of course, that growth wasn’t enough to prevent the meltdown in financial markets last fall that touched off sharp declines over the next three quarters. … some pretty promising news. For the first time since the recession began, the portion of companies planning to add employees in the next six months outnumbered those expecting to cut jobs, according to this month’s quarterly survey of economists at 78 firms by the National Association for Business Economics. Do you need debt settlement services? Debt settlement is simply the process and approach to getting out from under your unsecured debts. When you get into a debt settlement program you should be given a two basic services — a solution to lowering your unsecured debt and help in dealing with your creditors — these two services should help get you back on the path to financial freedom. 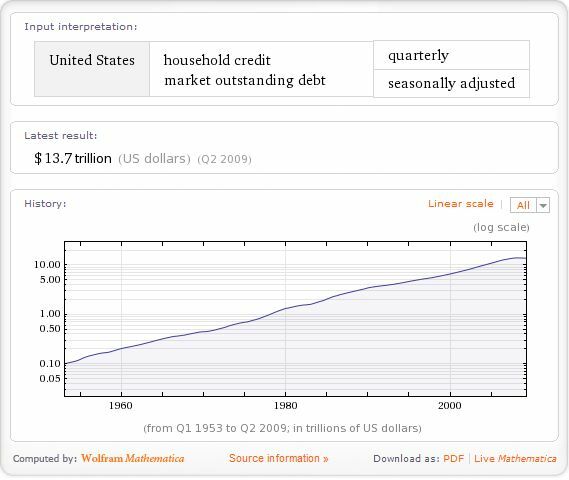 Right now household debt is a serious issue in the United States, and in this economic climate coupled with this level of unemployment debt is crippling for many people. Once you’re deep in debt it is very easy to lose control of the situation. And if you’re unemployed, or you are using credit to cover bills and basic necessities, debt can overwhelm your personal financial situation. When you reach a point of crisis your options become somewhat limited. Debt settlement is the best choice for most people, but other options include credit counseling or even personal bankruptcy. The key to getting on top of debt problem is, of course, recognizing the problem in the first place. Usually debt problems have many ways to reminding you, maybe multiple times a day through collection efforts, of the problem. The next step is to not go into despair or resignation and start taking action to fix your debt problems. If you are looking to go the debt settlement route you are halfway there. Be sure to take your time and choose your debt settlement company carefully. Make sure the company doesn’t make claims unsupported by the Federal Trade Commission, take note of their questions about your debt situation and household budget, get all the details about your program and find out up front how you will be charged for the service. Household debt is an issue in the United States, and in the current economic climate and level of unemployment it is crippling for many people. Once you’re underwater it is very easy to lose control of the situation and if you’re unemployed, or you are using credit to cover bills and basic necessities, debt can take over your personal financial situation. Once you reach that point your options become somewhat limited. The most drastic step is personal bankruptcy, but there are drawbacks to that approach and personal bankruptcy underwent significant reform in 2005 making personal bankruptcy a much more difficult process. Other choices include credit counseling and debt settlement. If personal debt gets beyond your control, of the three options listed above seeking professional debt settlement help is the best for most people. You don’t need to repair your credit. What you do need is to reduce your personal debt to a manageable amount, get that debt paid off as quickly as possible and move forward with your personal finances. Debt Settlement is process and approach to becoming free of unsecured debts. The goal of a debt settlement program is to find the best solution to lower your debts, help you deal with your creditors, and get you on the road to financial freedom. A debt settlement program can help you be free of unsecured debts in as little as 2-3 years for a fraction of your original owed amount. Even better than simply saving money is that once the settlement payment is made, your accounts will be satisfied – meaning you no longer have any of your original debt outstanding. Hit the above link for the six steps to debt reduction. More of that, “Well, the news still isn’t good, but it is better than we thought.” There’s a lot of looking for any ray of positive economic news still going on. The U.S. economy contracted at slower pace than previously thought in the second quarter as improved consumer and business spending cushioned the impact of a record decline in inventories, according to a government report on Wednesday. The Commerce Department’s final estimate showed gross domestic product fell at a 0.7 percent annual rate instead of the 1.0 percent decline reported last month. Analysts polled by Reuters had forecast GDP, which measures total goods and services output within U.S. borders, slipping at a 1.2 percent rate in the second quarter after dropping 6.4 percent in the January-March period. This will probably mark the last quarter of decline in output for the U.S. economy, which slipped into recession in December 2007. The economy is believed to have rebounded in the July-September quarter. With the second-quarter contraction, the country’s real GDP has shrunk for four straight quarters for the first time since government records started in 1947. Or was it nearsighted? Or maybe just plain blind as bats. At any rate this is a humorous, and sad, collection of quotes from erstwhile kings of Wall Street. What happened next: With clients pulling their money from Lehman accounts, the firm ran short of cash. Fuld reportedly turned down a financing offer from Warren Buffett, perhaps because he thought a government bailout—like that of Bear Stearns—would come with better terms. But no bailout materialized, and Lehman filed for bankruptcy on Sept. 15, 2008. I’ll have to admit, this is one mortgage vehicle I’ve never heard of, and it sounds pretty bad. I thought I was ahead of the curve 0n commercial paper, but clearly the insanity at all levels of real estate are going to reverberate for quite some time. The federal government and states are girding themselves for the next foreclosure crisis in the country’s housing downturn: payment option adjustable rate mortgages that are beginning to reset. “Payment option ARMs are about to explode,” Iowa Attorney General Tom Miller said after a Thursday meeting with members of President Barack Obama‘s administration to discuss ways to combat mortgage scams. “That’s the next round of potential foreclosures in our country,” he said. Option-ARMs are now considered among the riskiest offered during the recent housing boom and have left many borrowers owing more than their homes are worth. These “underwater” mortgages have been a driving force behind rising defaults and mounting foreclosures. In Arizona, 128,000 of those mortgages will reset over the the next year and many have started to adjust this month, the state’s attorney general, Terry Goddard, told Reuters after the meeting. Americans plan to refrain from boosting their spending even after the biggest drop in consumption since 1980, signaling concern about the direction of the economy over the next six months. Only 8 percent of U.S. adults plan to increase household spending, almost one-third will spend less, and 58 percent expect to “stay the course,” a Bloomberg News poll showed. More than 3 in 4 said they reduced spending in the past year. Respondents were divided over whether the economy will get better or stay the same in the next six months; only 1 in 6 said things will get worse. More than 40 percent of those surveyed said they feel less financially secure than they did when President Barack Obama took office in January, outnumbering 35 percent who said they feel more secure.